Come enjoy an intimate evening with one of the most entertaining and inspiring artists in the country today! Get your tickets now ($15 online/ $20 at the door), mark your calendar, and be at the Spanish Fork Angelus Theatre on Saturday, August 25th at 7:30 PM to experience a one-of-a-kind Michael Kelsey show. It’s not just about hearing a guitarist playing some songs. It’s about being in the experience with Kelsey who strives “to be in the moment and authentic to the song/performance.” That authenticity comes shining through in every performance. In a recent press release, Kelsey’s musical prowess was described as being a “free-flowing improvisational style to the guitar that involves every inch of his instrument. From his funky, percussive playing style that conjures an image of a one-man version of STOMP to lush instrumentals reminiscent of Michael Hedges/Phil Keaggy, his performance blends multiple musical genres and vocals along with some techno fun to create a sound all his own. It is indeed a very unique sound, and once you’ve heard it, it sticks with you. 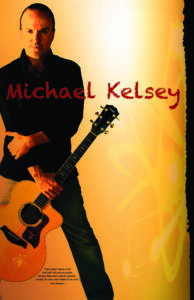 To learn more about Kelsey, and his music, visit Michael Kelsey Music. Many Spanish Fork residents have been coming to Kelsey’s shows for over a decade, delighting in introducing the Michael Kelsey experience to their friends. In a recent interview, Kelsey shared that his favorite thing about coming to Spanish Fork is the rapport he has with the crowd. He loves it when people share stories and memories from past shows having grown up with a tradition of going to hear Kelsey perform. He says, “The folks that I have come to know in the area are like family so it feels very natural to visit my other home.” — Welcome home Michael.